Der T-150 ist ein sowjetischer schwerer Panzer der Stufe 6. Am 17. Juli 1940 trafen der Rat der Volkskommissare der UdSSR und das Zentralkommitee der Gesamtsowjetsichen Kommunistischen Partei der Bolschewiki die Entscheidung, neue schwere Panzer zu entwickeln. Bis zum 5. November baute das Kirowwerk den Prototypen T-150. Die Erprobung zeigte massive Mängel bei Motor und Aufhängung des Fahrzeugs. Der Plan war, die Serienfertigung im Juni 1941 zu organisieren, sobald die Mängel beseitigt waren. Der Panzer erhielt die Bezeichnung KV-3, die Entwicklung wurde jedoch eingestellt. Der Grund war, dass die Deutschen anfingen, an einem schweren 45-Tonnen-Panzer zu arbeiten. 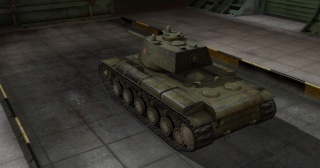 Despite its name, the T-150 is an upgraded KV-1. It has the same chassis and turret, with some notable improvements. 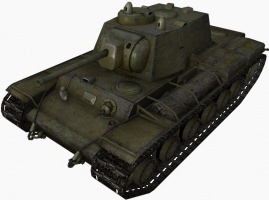 Additional armor has been added to the hull, a considerably more powerful engine is available, and perhaps most importantly, it can mount the 107 mm ZiS-6 gun. The tank can in fact be frustrating at first, but stick with it, and the improvement of the tank will be extremely noticeable. The T-150 has an extremely tough grind to its top gun, arguably worse than that of the M3 Lee, because in order to mount the top gun, you need the turret, and for that you need the suspension too (a high grand total of 23,450 XP). The grind can be lessened somewhat by first researching the KV-2, as you will be able to research the V-5 engine and the ZiS-6. 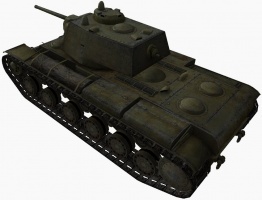 The alternative KV-85 is more mobile in terms of maneuverability and sports a more consistent 100mm as well as a more damaging, but slow-reloading 122mm, but lacks the solid overall armour and respectable alpha and DPM of the T-150. Der T-150 führt zum KV-3. Excellent at sidescraping due to side armor thickness and large tracks. Strong turret with small weakspots. Powerful 107mm with good penetration and damage, acceptable rate of fire. When stock, the T-150 is slow, well armored, but not enough, sluggish and weakly armed, playing much like low-tier French light tanks. Stock it equips much of the same weapons of the KV-1, like the 57mm Project 413, 122mm U-11, and the KV-1S's 85mm S-31 cannon that has 1mm less penetration than the KV-1's 85mm F-30 and is 10kg lighter, but is otherwise identical. The stock 76mm ZiS-5 gun is an amusing novelty and has no business being in a tier VI heavy tank. The other weapons have good damage and acceptable accuracy, but severely lack penetration. The 122mm U-11 provides the most consistent penetration/damage rate out of all the guns you can mount before the 107mm and is therefore most likely the best choice for your stock grind. Once upgraded with the 107mm ZiS-6 and engine, this tank is a nice upgrade to the KV-1. 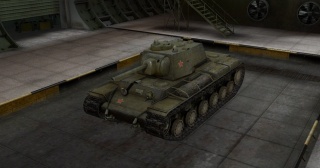 In contrast with the KV-2, this tank has better armor, with a turret that's much lower in profile, tougher, with faster traverse and sloped sides. 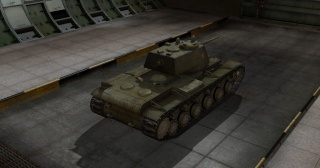 Therefore, a T-150 with the ZiS-6 is quite a bit better than a KV-2 with the ZiS-6, although the reload time is slightly longer and the T-150 naturally can't mount the KV-2's 152 mm M-10. 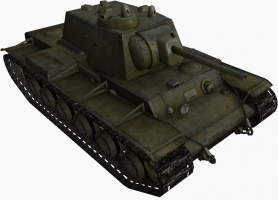 The 107mm ZiS-6 is a far cry from the 122mm D-2-5T of the KV-85. While the 122m deals 90 more damage per shot, the 107mm fires twice as fast. This means that while you lose out on the large alpha damage and psychological value of the 122mm, you also don't have to worry so much about reload times, allowing one to HOLD, not just defend, a single point. The 107mm is also 0.05m more accurate than the 122mm. The tables are turned, however, when you compare the T-150's 107mm gun with the KV-85's 100mm gun. The 100mm not only reloads faster than the 107mm, it handles better and has slightly better AP penetration at the cost of only 50 damage per shot. An economical advantage of the 107mm over the D-2-5T and the 100mm S-43 is that its shells have an excellent damage-for-cost value. At 270 credits for 300~ damage, the 107mm definitely outclasses the D-2-5T's 1025 credits for 390~ damage and barely outclasses the S-43's 252 credits for 250~ damage This makes the T-150 a cost-effective credit farmer compared with the KV-85 and both of its main guns. A very well known mistake when people drive the T-150 is that they think the tank is invincible, and make no attempt to angle or use sidescraping techniques. This results in many times a player dying uselessly in the first few minutes of the game. 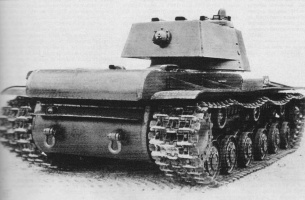 To do well in this tank, make full use of its armor; when facing tanks out in the open, angle that armor at no more than 45 degrees to give a lesser chance of penetration, when in a city, use sidescraping to bait tanks into shooting at the side and return fire when they are reloading. Used properly, the armor of a T-150 can prove to be a frustrating obstacle even to Tier 8 heavies. After the introduction of the Japanese Heavy tank line, the T-150 finds itself a victim of the power-creep. It is outclassed by the O-I in terms of firepower and armor. Both the 15cm and the 10cm guns of the O-I are significant threats in close-quarter battles. Ironically, the T-150 must look to its marginally-superior mobility and smaller profile in order to challenge the O-I and subsequent Japanese heavies. Bringing more gold rounds also helps. Make no mistake, the T-150 is still a potent heavy tank in the hands of a player who understands how to maximize its strengths. The 57 mm 413 and 122 mm U-11 guns, and the 10RK radio carry over from the KV-1. Mount whichever gun you prefer immediately. Research and mount the suspension. Now, research the ZiS-6 as soon as possible. Lastly, go for the engines. "By 1 November 1940, the Kirov Plant is to prepare two KV tanks with 90 mm armor. One of them will have the F-32 76 mm main gun, the other an 85 mm main gun. One hull will be delivered from the Izhorsk Plant at the end of October and the preparation of this tank is to be completed by 5 November. The second hull will be completed in November. By 1 December 1940 the Kirov Plant is to prepare two KV tanks with 100mm armor. One will have the F-32 76mm main gun, the other the 85mm main gun. One hull will be delivered at the end of October, the other in November." However, the deadline was not met. 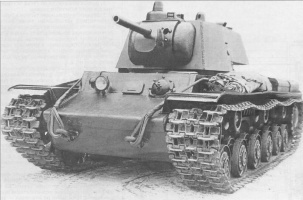 The plant delivered one KV with 90mm armor and the F-32 Main Gun on 5 November (in documents it is referred to as tank T-150 or Object 150), and one KV with 100mm armor and the 85mm main gun on 5 December (in documents it is referred to as "T-220" or "Object 220"). The T-150 was constructed on the base of the production KV and differed from it only in the magnitude of thickness of the hull armor, which had been increased from 75 to 90 mm. Because the thickening of the armor plates was accomplished externally, all the internal dimensions of the vehicle remained unchanged. In addition, the T-150 had modified mounting brackets for the chassis components and a commander's cupola with periscope and three vision blocks. In connection with the increase in the tank's weight, which had reached 50 tons, a V-2 Engine whose output had been boosted to 700 h.p. was installed. From 15 January to 14 February 1941 the vehicle underwent range testing (199 km total movement), which exposed a number of substantial deficiencies in the functioning of the engine. For example, during movement on a hard-surface road in 3d and 4th gear, at ambient air temperatures of -9° to -12° the lubricant in the engine became overheated. For this reason the tank was withdrawn from testing, and the Kirov Plant and Plant No. 75 in Kharkov were directed to improve the cooling system and increase the temperature drop of the lubricant that passed through the engine. On 15 March 1941 the SNK and TsK VKP(b) by their resolution No. 548-232ss required the Kirov Plant to transition to mass production of the T-150 tank in June under the designation KV-3. "Combat weight - 51-52 tons, length - 6.76 metres, width - 3.33 metres, height - 3.0 metres, ground clearance - 0.4 metres, armor - 90 mm, armament - one F-34 76 mm main gun, three DT machine-guns, one PPSh submachine-gun, 114 main gun rounds, 2900 machine-gun cartridges, maximum road speed - 35 km/h, cross-country speed - 15-20 km/h, maximum slope gradient - 40 degrees, range - 250 km (10 hours), V-5 engine with 700 h.p., turret with commander's cupola, KRSTB radio set (with mounting of 71-TK-3 possible), and a guaranteed vehicle life of 2,000 km." 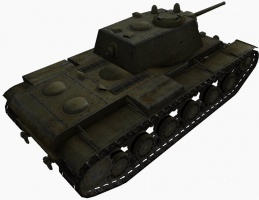 "Regarding the KV-3 Tank (T-150). 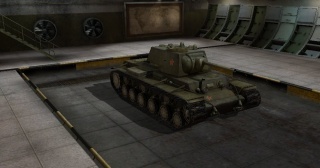 b) by 25 April 1941, together with the Izhorsk Plant, present for approval of the NKO a mockup of the KV-3 turret. 3. The Kirov Plant will establish a plan for production in 1941 of 500 KV-3 tanks with the ZIS-6 107 mm Cannon.